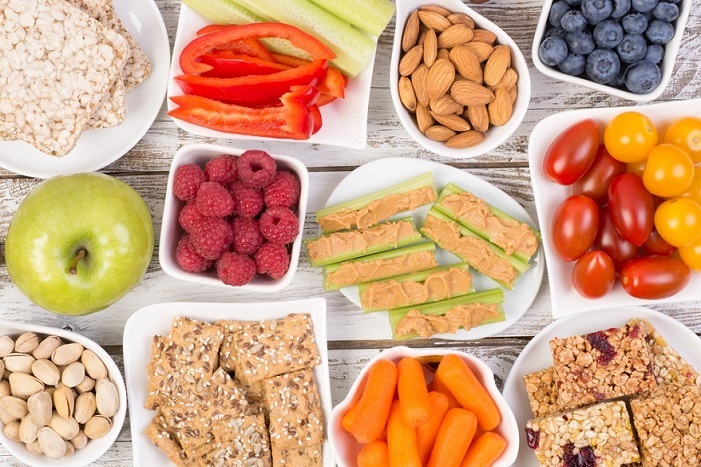 In order to refrain from visiting the vending machine or reaching for an unhealthy candy bar or chips in the afternoon, it is important to have some healthy snacks on hand. After your day has consisted of waking up before dawn to get in 5 minutes of meditation, packing to-go lunches, running through emails, and scheduling meetings, it feels like you’ve been awake forever. By the time it’s 1 p.m., the midday slump hits. You feel like you’re running low on fuel, and a Starbucks run can barely help to keep you awake. While you’re at it, the temptation to grab a pastry may be high, especially on their Double Stars Day! Before you make a reach for the sugar-loaded double fudge chocolate chip brownie, remember that your taste buds may enjoy the sensation for a moment, but your conscience might experience regret, later. It’s okay to treat yourself every now and then, but we often make decisions based on what’s convenient. You don’t have to punish yourself with crazy exercises when you indulge, but it is important to choose healthy afternoon snacks as often as you can. Make these 5 healthy afternoon snacks your first resort next time you’re experiencing mid-day cravings. They’ll make a delicious addition to your snack stash for the office! Skip the heat and radiation by opting for a no-bake healthy afternoon snack! This one will be like music to your ears and requires no oven nor a microwave. With 5 simple ingredients, you can make delicious peanut butter protein bites that are fulfilling and make a good source of fiber. This recipe will give you a breakdown of the steps, which will take less time than it’d take for your kids to get dressed and out the door. If there’s such a thing as classy candy, it’s Yum Earth’s Hot Chili Mango Organic Lollipops. You’ll not only be hiding these away all for yourself on the top shelf, but the kids will be onboard, as well! Organic candy has become all the buzz so that you can enjoy your favorite sweets minus the excess sugar. Now, YumEarth has become the organic candy brand in the country. You can see how quickly their shelves empty at your local Whole Foods store. Their Hot Chili Mango flavor is all the rage, and vetted and recommended by bloggers and Instagram influencers. Who says you can’t whip up a celebratory treat mid-day such as a parfait? These desserts aren’t just for birthday parties or special occasions only. After all, for all of the energy you spend listening to coworker rants or pretending to enjoy small talk with strangers, you deserve a treat! This Vanilla Berry Yogurt Parfait recipe requires minimal ingredients, with items that you can pull from your pantry like a protein bar, berries, or chopped fruits. Not only are they as good as an afternoon snack, but you can bring them anywhere next time there’s a BBQ or pool party. If you’re at the office and want to avoid looking high-maintenance, try using a mason jar or bowl instead of the usual fancy parfait cups. Maybe your day isn’t as glamorous as a dinner at P.F. Changs, but that doesn’t mean you can’t have a taste of luxe as you’re running errands! The chain restaurant may have come up with the original famous lettuce wraps, but this vegetarian version of the recipe makes a good dupe! You’ll win over your whole team and boss with this one! In addition to meal delivery plans, Fresh n’ Lean also offers a la carte options, with an endless selection of vegan snacks to choose from to stock up for the pantry. Our Tomato Basil Chips are 100% plant-based and will keep you powering through your day, feeling energized until the very end. With these healthy afternoon snack ideas up your sleeve, you never have to complain about going hungry come mid-day ever again. While you’re at it, win some hearts over by bringing leftovers to your next cycling sesh. Sharing is caring!